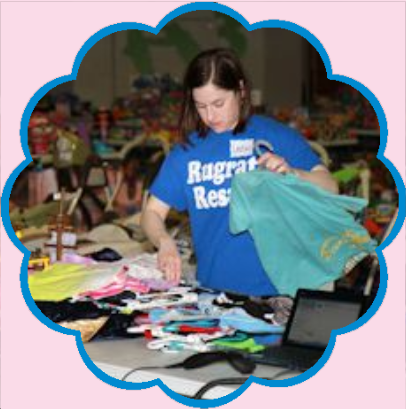 Rugrats Resale depends on our Volunteers for a smooth running sale. Volunteer shifts generally run for 3 hours. Certain shifts count as two shifts toward the volunteer incentives. If you aren’t physically able to work the sale, we offer a limited number of non-labor shifts. Flyers should be hung or distributed 1-2 weeks before the sale and are available here for download to be printed. Flyer Hanging: Hang 10 pull tab flyers on community bulletin boards in grocery stores, restaurants, medical offices, laundromats, gyms, or anywhere else you can think! Please use your best discretion to keep the Rugrats name in good standing with the community. Flyer Distribution: Get permission to have flyers distributed at your child's daycare, school, or other activity group. If you own a business, you could refer us to your customers! Sign Placement: Place a lawn sign on your property for a week or two before the sale through the end of the sale if you live on a busy road. Remember: Rugrats Resale survives because of community support, so help us by telling your friends!